Last week on DCI.org, we focused some editorial firepower on anecdotes and stories related to front ensembles. Think back to those formative, funny, inspiring or memorable front ensemble stories and send them in! They can be as long or as short as you would like. Attach a picture of yourself or the situation you're writing about if you can. And by all means, pass this on to your pit-lurking friends! We'll edit these stories for clarity, grammar and appropriateness. If you have a pit-related anecdote or story, send it to content@dci.org. 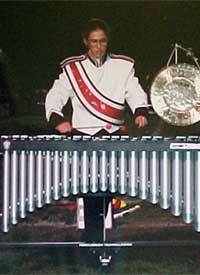 Lauren Davis sent in this account of her rookie months with the Crossmen. When I auditioned for the Crossmen in December, I had no idea what to expect and I had no idea of all the work that I would put into coming to the camps. I practice on average two or three hours a day. I usually practice at night, but sometimes in between classes, I will have one of the tunes in my head and have the desire to play it. When I go to camps on Friday nights I get nervous, but by Saturday, I start relaxing. It has been much easier now to go on Friday nights and be relaxed. The friends I have made so far are everyone in the pit, some battery and baritones. All of the people who were accepted into the pit, including myself, have gotten along very well. We talk online all the time and send e-mails back and forth keeping up with what is happening. All of us are so completely different, yet we all love each other. There are 11 of us -- four girls and seven guys. One guy, Charlie, wears tie-dye all of the time. It's great, I love it. I actually made a tie-dye shirt and wore it this past camp. Everyone shares a piece of themselves, and we really get to know each other. The best times we have getting to know each other is at meals and before bed in our pit circle. We talk about boyfriends, girlfriends, home life, school, finals and whatever the topic is. I am really happy I was accepted into the Crossmen pit. Sometime I get really frustrated during practice, but I know that everything that is said and done is to make me a better performer. I just keep trying. The instructors are great! When I was first introduced to Drew Schnieders, our arranger, I thought to myself, "OK, he seems cool." Little did I know -- then he said that he was in the show "Blast!" for two years and in Star of Indiana. WOW! I am being instructed by one of world's best performers. This was amazing. Steve Ballard, our instructor, marched with the Crossmen and the Santa Clara Vanguard. Lee Beddis has his own signature sticks. It was a bit of a shock to know that I was under the instruction of the best performers out there. They have all taught me so much that I am grateful for. I now feel comfortable with how things are working and how everything will work out in the future. The instructors push me and everyone else hard to get things done, but I am getting used to it all. My high school also had a strong instructing crew, but it has been a while since then. Even when I don't think I want to move on, I keep going to do the best I can and when I do, it feels great. Drum corps rules! There are three weeks remaining until move-in for us and I am a bit nervous. When I had band camp at school, there were three weeks. The middle week was 9 a.m. to 8 p.m. Drum corps is about 9 a.m. to midnight or so, and spring training is 9 a.m. to midnight every day for four weeks. I am sure that everyone in the corps will help us all get through each day at a time. I really love how encouraging the people are in drum corps. This summer is going to be so amazing, I can't wait!